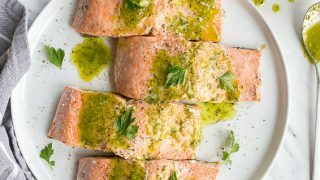 Salmon sauce recipe that makes Whole30 salmon so delicious! This bright parsley sauce enlivens anything it touches! 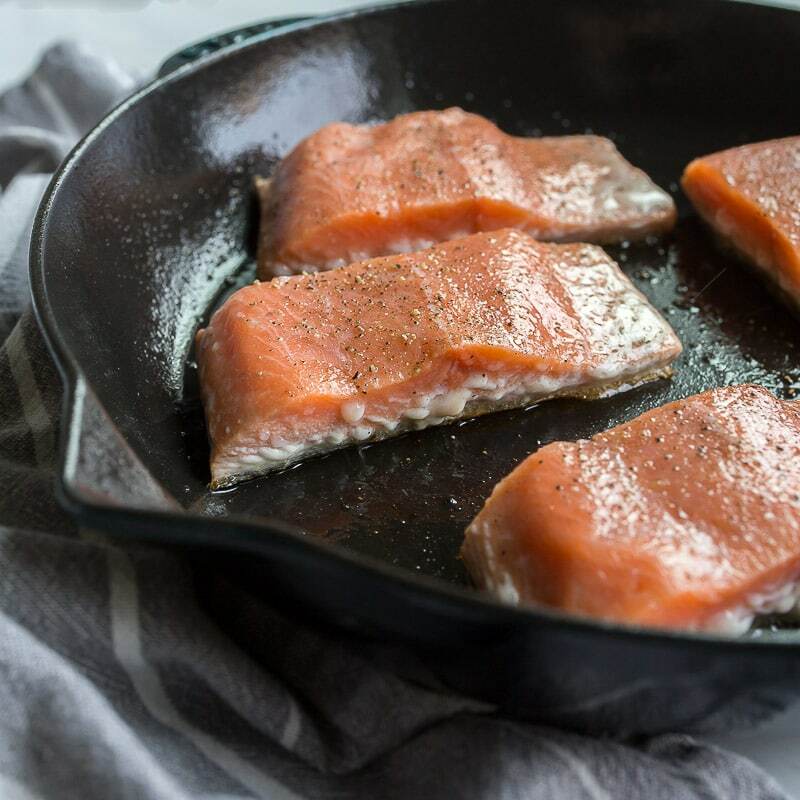 Plus, an easy recipe for salmon that starts on the stove and finishes in the oven for perfect salmon, every time! You’re looking at the salmon sauce recipe that makes me a new woman. Albeit a new woman who can’t wait for Whole30 to end, but a new woman, nonetheless. This sauce is so magical; it makes anything it touches 1734 times more delicious. This salmon sauce recipe comes from my talented friend Sherrie. Sherrie is a super talented blogger, and chef that hosts plant-based pop-up dinner events. My first taste of her parsley oil occurred at one of her pop-up dinners. It’s the type of sauce that highlights everything it touches. Sherrie uses it to make a killer bowl for lentil soup. I have since made it to top countless things. 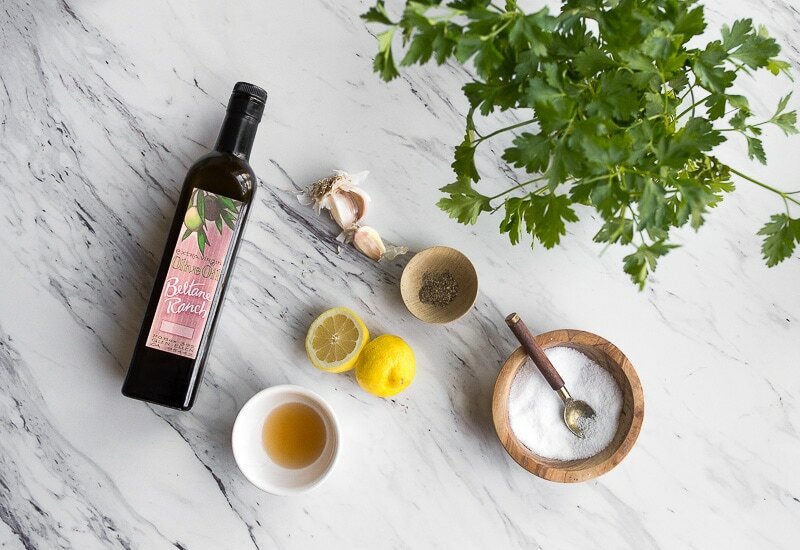 The leftovers are great as a salad dressing, or as an integral part of a salad dressing. 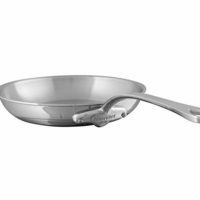 It’s great for dunking flat breads, and I also love to stir it into plain yogurt for a soup garnish or crudité dip. In the midst of this Whole30 challenge, I began to crave bright, acidic tangy flavors. Eating a few clementines wasn’t enough for me. Protein is my biggest challenge for Whole30, because I don’t really enjoy eating a lot of meat. I’m not sure if there’s any truth to the Blood Type Diet, but my blood type is A+. According to the Eat Right for Your Type book, we’re typically vegetarians by nature; we don’t process meat very well. We gravitate towards lentils, beans, and full-fat dairy. I have to confess that when I read this, I was completely shocked, because I was already eating this way before I knew my blood type. If your blood type is A+ and you can’t stand these foods, let me know! I would love to chat further about this. So, a bright, fresh and herby salmon sauce is just the thing to get me through this Whole30 challenge. 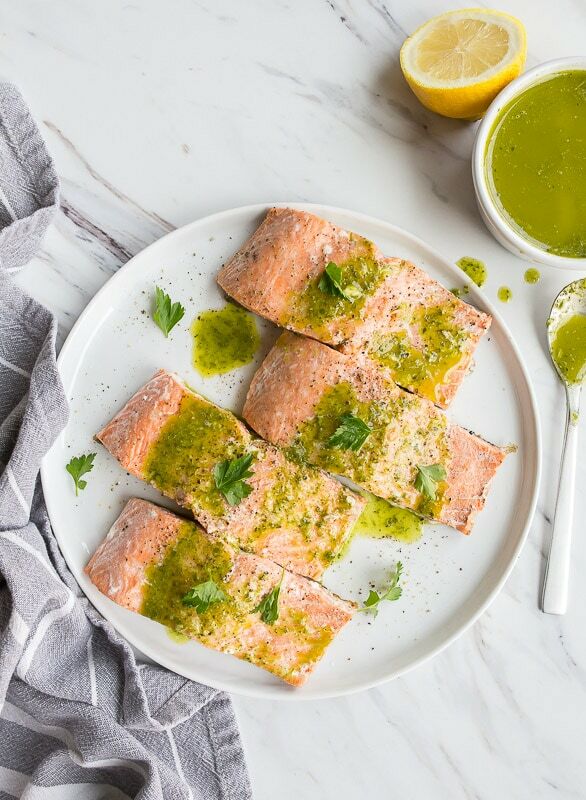 The parsley salmon sauce recipe is so simple to make in a blender. It’s just 2 big handfuls of fresh parsley, the juice of a lemon, apple cider vinegar, one garlic clove, olive oil, salt and pepper. That’s it! You will have a bit leftover after making this Whole30 salmon, but it’s great to save for a veggie dip or topping any type of protein. Parsley is supposed to be a detoxifying agent for our liver, and it’s a great thing to consume while doing a Whole30 challenge. One of the cool things about this recipe is that you won’t need to flip the salmon in the pan. Cooking fish can be intimidating, because if it sticks to the pan, it’s mostly ruined! So, we’re not going to flip the fish even once! We’re going to season it on both side, place it in the pan skin-side down and leave it. After it cooks half-way through in the skillet, transfer it to the oven to finish cooking. You can watch salmon cook by checking the sides of the fillet. See how the white portion is starting to come to the surface of the filet, and it’s less translucent half-way though the side of the filet? This is the time to transfer it to the oven to finish cooking! The oven cooking portion will depend on how you like your salmon. We like ours a bit rare, so we check it after 10 minutes, but it could take up to 15 minutes to cook all the way though to your liking. When we cook on the skin side and never flip the salmon, the skin becomes wonderfully crisp and totally edible! It’s like the restaurant salmon of my dreams. If you’re weird about eating salmon skin, it’s okay, I’ll eat your portion. Maybe I’m not weird about it because we buy wild Alaskan salmon from Market House, and it’s super fresh. 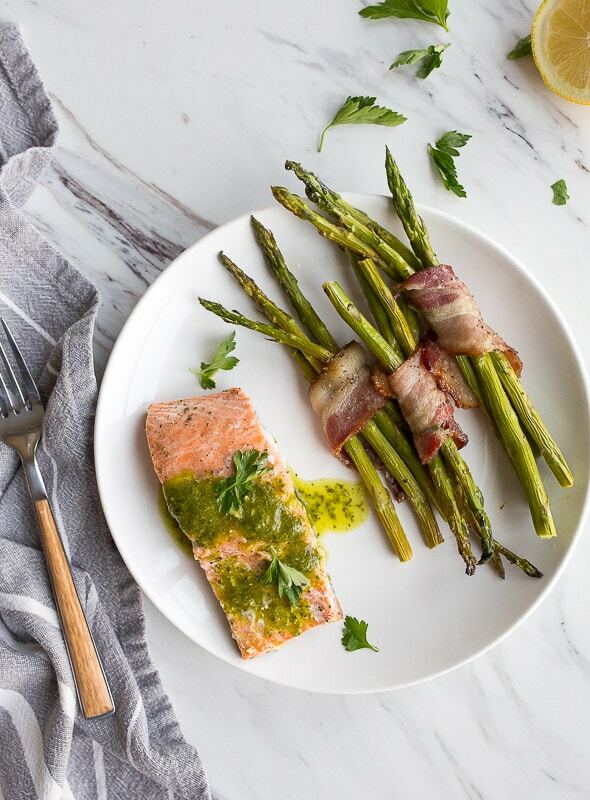 I served this Whole30 salmon sauce recipe with my bacon wrapped asparagus, and it was a hearty, satisfying dinner for two. You can find all of my Whole30 recipes here. 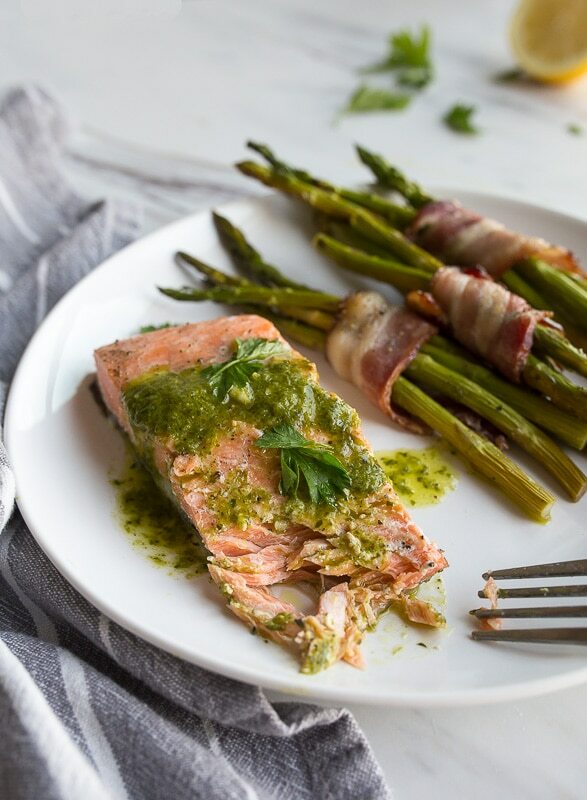 A bright and flavorful parsley oil makes a great salmon sauce for your next Whole30 salmon dinner. First, make the salmon sauce: combine all of the ingredients in a high-speed blender, and pulse until very smooth. Pour into a jar, and set aside. Next, sprinkle salt and pepper on each side of the salmon fillets, and heat a large skillet over medium-high heat. Add the olive oil to the pan, and then add the salmon, SKIN SIDE DOWN. Watch the salmon cook on the edges. When it's half-way cooked, move the skillet to the oven to finish cooking. No need to flip this salmon! Cook the salmon in the oven to your desired level of doneness. I like my salmon a little red in the middle, so I cook it for 8-10 minutes, but if you prefer it all the way done, cook it for 12-15 minutes. 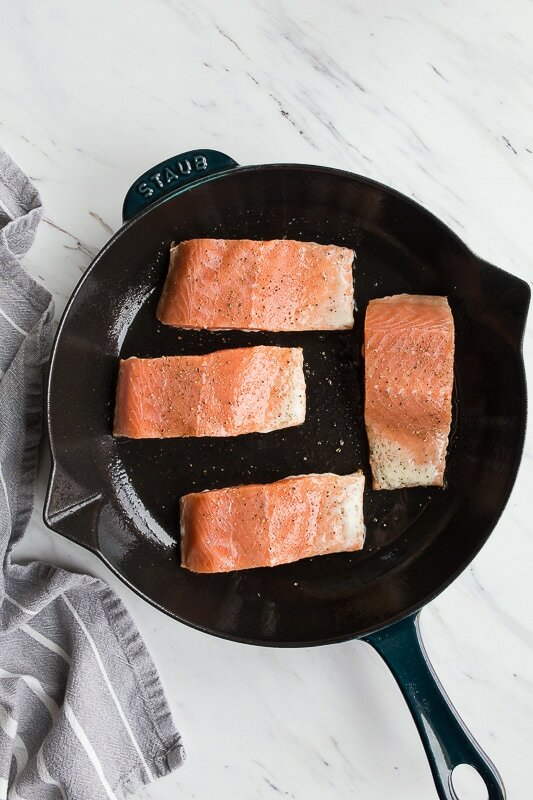 Remove the salmon from the skillet, place on a serving dish and drizzle with the parsley oil. I love crispy salmon skin! It think it’s all the salmon skin hand rolls I grew up eating. And now I want sushi which is definitely not whole30. Both the salmon and the sauce were delicious! My salmon did not have skin but the cooking method still worked great. Thank you for another terrific recipe!